MIDDLETOWN—County Executive Steven Neuhaus presented Superintendent Dr. Kenneth Eastwood with a check for $6,000 on May 10 to help the school district host state championship sports events. Eastwood supports the county exec’s sentiments. “We’ve hosted over the last nine years a number of championships that have brought thousands of visitors and millions of dollars into our community.” He tells of the time he was in the Dollar Store during a track meet and the shelves were almost empty. The state boys’ soccer semifinals and championships at Middletown have alone generated about $500,000 annually for Orange County’s economy. According to county estimates, the state boys’ soccer semifinals and championships at Middletown have alone generated about $500,000 annually for Orange County’s economy. The boys’ lacrosse final is expected to add about $250,000. The boys’ and girls’ track and field championship is anticipated to generate approximately $500,000. The state arranges competitive bidding for the right to host championship sporting events. Director for Physical Education, Health, and Athletics for Middletown schools, David Coates, said the county grant will “help us become extremely competitive when we put in future bids. 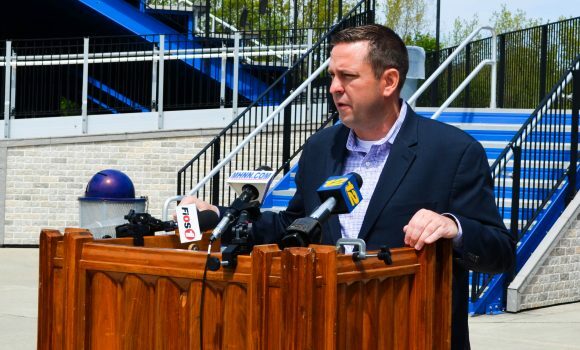 It’s going to help us offset our costs that it takes for us to run a championship here in Middletown,” especially for site security and custodial personnel. Coates said the school district wants to attract soccer, football, lacrosse, and track & field events. For soccer events, Faller Field has the distinction of being one of only six in the United States certified by FIFA, soccer’s international governing body. Neuhaus was joined at the event at Middletown High School’s Faller Field by other members of the Middletown school board, Orange County Tourism Director Susan Hawvermale, and Orange County Legislators Jeff Berkman and Michael Paduch. The press conference began with the Middie Navy ROTC color guard, led by Chief Petty Officer Logan Gonzales, presenting the flag for the Pledge of Allegiance. 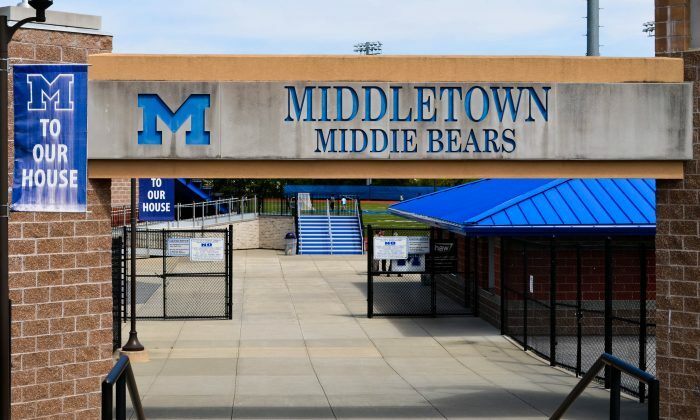 Middletown High School has successfully hosted the state boys’ soccer semifinals and championships since 2010, will host the boys’ lacrosse finals in June, and the boys’ and girls’ track and field championships in 2019.